The allies were in uncharted country again. But the Navy found river junks, ideal for moving artillery. The emperor’s cousin asked for a final meeting halfway to Beijing, so Parkes was sent to discuss Elgin’s reception. A group of others, French and British, rode for talks under flags of truce, but Parkes and others detected Chinese troops preparing to envelop the allies. Parkes and others were taken to Prince Sangkolinsin, and thence to prison. The allies now confronted 20,000 or 25,000 Chinese in prepared entrenchments, and a determination to punish Chinese treachery became a major reason for allied policy. Meanwhile, the battle turned serious. 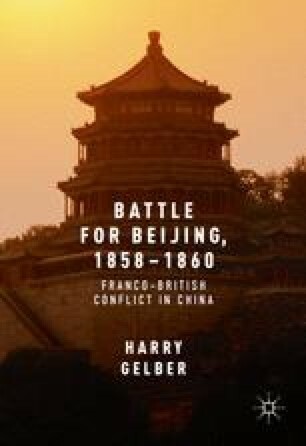 The French faced great cavalry attacks, which showed, allied officers decided, that Chinese officers had been heroic but notably incompetent.